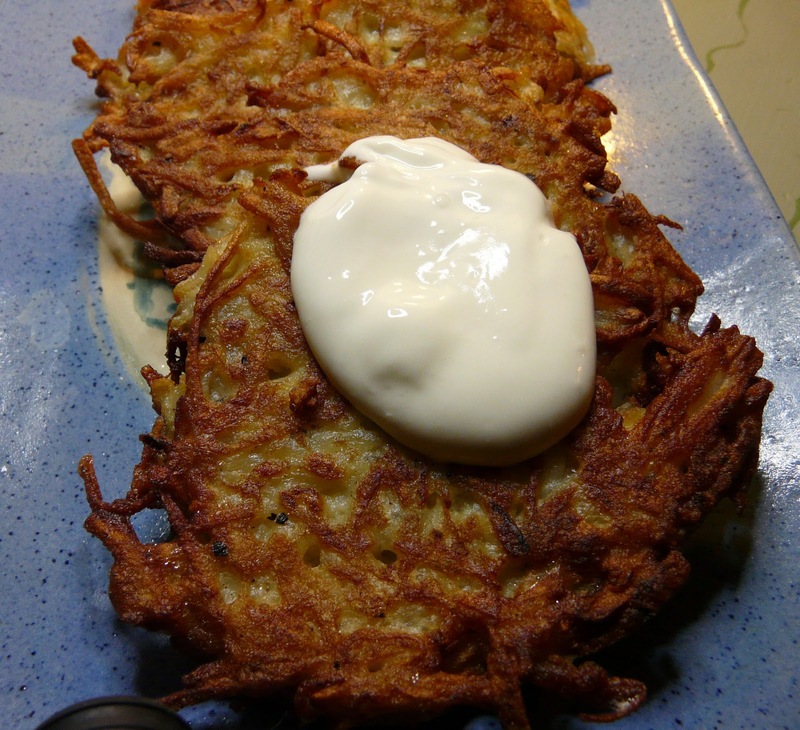 There were so many forum posts and blog posts about potato latkes this past week that I couldn't resist making them myself. 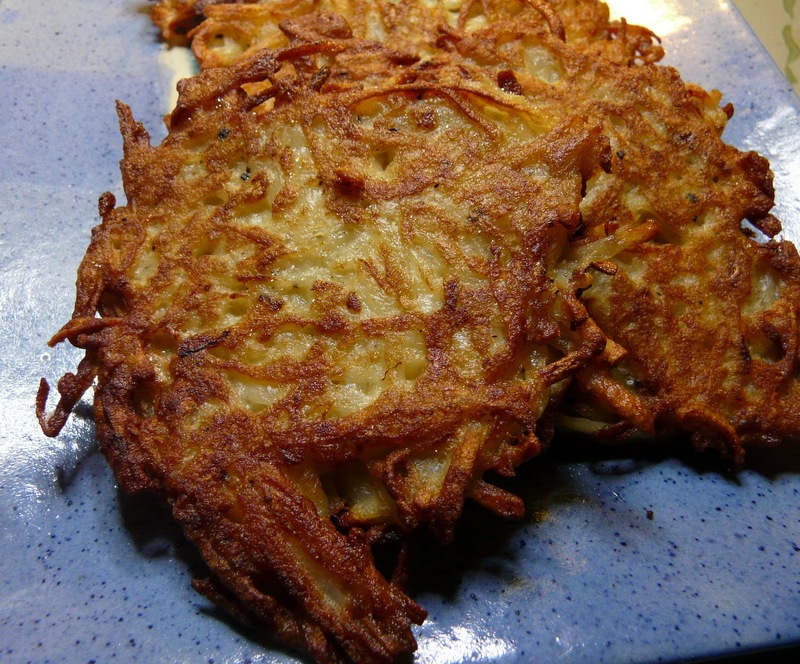 I like my latkes crispy on the outside but soft on the inside so I parboil whole peeled russet potatoes for just 5 minutes to so. Just enough to start the cooking process. Then I grate them using the Food Processor. I also grate the onion using the food processor. Everything is then emptied into a large bowl, eggs are added, a little flour and salt and pepper. What is nice about parboiling the potato is that you don't have to then squeeze the liquid out of the potato (like you do with raw potatoes) and the potatoes do not turn black. Heat a cast iron pan, add oil and then using your hand or a measuring cup scoop up some of the mixture and add to the hot oil. When one side is golden and crisp, turn over and cook the other side. Serve with sour cream. I must confess to serving my potato latkes this week as a side with grilled baby back ribs. Two words that will catch my attention every day of the week are "crispy potatoes." 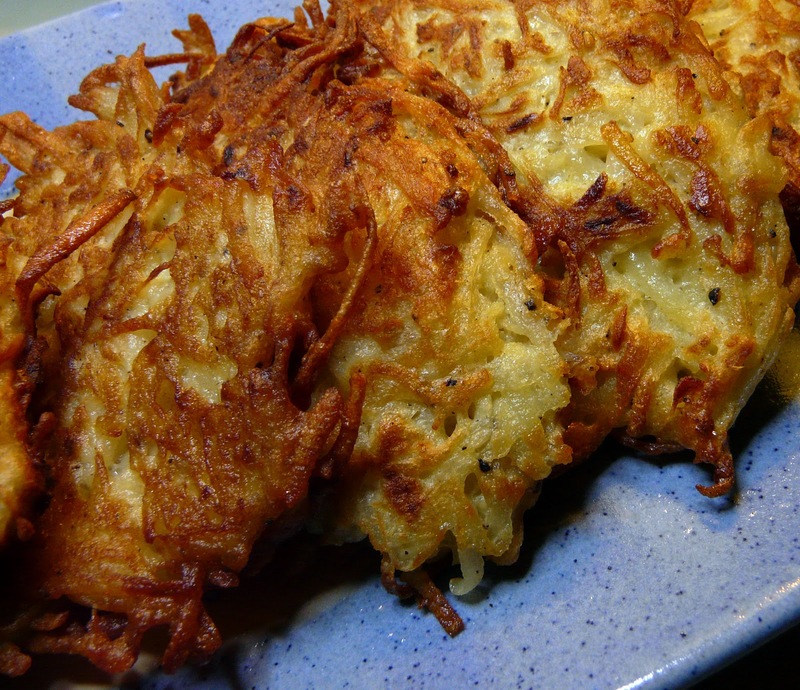 Now that I have time to cook again I'm making these latkes ASAP. Just mouthwatering, Ann. Gosh these look good Ann..
Crispy sounds like a treat. My usual method has always been using leftover mashed potatoes and making potato cakes. I need to try the latkes. They look delicious. These look beautiful Ann...just gorgeous! And I bet they are delicious with ribs!